Welcome to The Hope Chest Reviews, John! Let's get started by discussing those romance novel covers. 1. How did you get started modeling for romance novel covers? 2. Do you do individual cover shoots or stock photo shoots? I do both, and this year I plan on doing more shoots with photos that will be better than ever. I try to be as versatile as I can as a model in this industry. 3. What was the first romance novel cover you appeared on? Captive Fantasy by Ann Mayburn in which I am a prisoner! I have to admit it was fun getting into the orange jump suit for the photo shoot. 4. How many covers total have you appeared on since then? 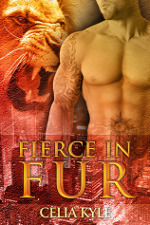 As of right now, Fierce In Fur by Celia Kyle and Taabia Dupree has me on her cover for Jessica's Obsession which is coming out any day now. Kharisma Rhayne just claimed my 'Angel of Satan' cover art image for her book coming out this year, Dark Retribution: Warriors of Malice series. I also have dozens of other images that have been scooped up by other authors for their covers coming out in the near future which I am looking forward to. 5. Do you have a favorite cover? 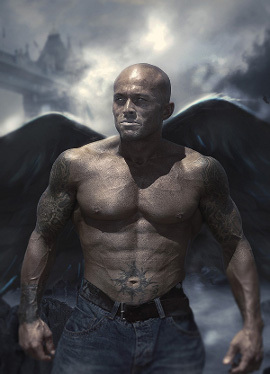 I don't have a favorite cover, but I really do like my ‘Angel of Satan' image as the physique is 100% mine on it...abs, veins and everything. :-) People who have seen it tell me if they could imagine what Satan would look like in the human form I am the definition of it. That means a lot as I really get into my characters so it was a job well done. My friend called me the other day and said his kids saw the image and were terrified, I had to laugh as it does look real and that was the goal. 6. Have you ever read any of the books that you've appeared on? I don't, it is funny as I don't like to read any of the books that I am in, watch any commercials or videos either, as "I am just me." I know it sounds kind of funny because often times I am ‘acting' out of my mellow relaxed character into something else during these projects. I just like to stay relaxed and focused on future projects rather than pick myself apart in the ones that have already happened. 7. Have you ever participated in any of the romance cover model contests? I'm sure my readers would like to know more about you, so now let's talk a little bit about your personal life. 8. You've done a number of different things throughout your career. Is there one accomplishment that stands out as having given you the greatest sense of satisfaction? I have been told by many people out there that I am very humble. I have always been true to myself and God, so win, lose or draw, I just love life for everything I have been blessed with being able to do. Keeping this in your mind, my answer to this question is this: the people along the way. The amazing friendships that I have formed throughout my journey. To me, accolades and press are just that, I am honored to be mentioned, but it is the people along the way that made John Quinlan and shaped him into the person he is today. When I look back on my life years from now at the things I have accomplished (which will include the ones in the near future that have yet to be done), it is the people I will miss the most. I did my best to bring some talent to the table, and if it wasn't for the special people who believed in me opening that gateway to showcase it to the world, those things would never have been seen. People are referring to me as the most tattooed male romance cover model in the world and I have to say that is pretty special. I am unique, and with me, I bring a fresh new look to the romance world that our current society can relate to. It represents not just Hollywood and professional sports but guys all over the globe. Tattoos are main stream now, and I am the poster boy who broke the traditional stereotype of "being bald and tattooed means you are a bad person." I truly appreciate all the wonderful people like you, Julie, and your Hope Chest Reviews, because without all of you, models like me would never attain the recognition for our accomplishments. 9. It sounds like you're a pretty busy guy. What do you like to do for fun? I haven't done Special Ops/Military yet, and people keep suggesting I get some model shots of this nature. I will definitely include this genre in my first spring shoot of 2013. 11. What personality traits in a woman are most appealing to you? The biggest one is a woman who DOES NOT constantly talk about herself. I have always associated that with the continuous need for "look at me...look at me" always needing attention, because down deep inside, she lacks self-esteem and hearing people act impressed helps her fill that void. Just for the record, let me say that is so annoying! That is pretty much it in a nutshell. With me, once this happens I just shut down. Thank you have a nice day, next person please. Women who possess a great attitude, who have ambition and are their own person with set goals, really appeal to me. 12. What's your idea of the perfect romantic evening? 13. This question is inspired by The Players Club, a favorite romance series of mine: If you knew you had only one month to live and had virtually unlimited resources, what three things would you want to do? 14. Since The Hope Chest Reviews is all about my passion for books, I can't wrap up without asking: What is your all-time favorite book? The Bible, it is the holy grail which gives me endless inner strength. Thank you so much for visiting with The Hope Chest Reviews today, John. It's been a pleasure having you, and we wish you all the best.